Morris Funeral Home began in 1919 near the end of World War I as Reynold’s Undertaking Service. Started by Gus Reynolds, the great uncle of Gus Morris, Jr., it was located near the Thomas Wolfe Home on Spruce Street. A County Commissioner and heavily involved in Asheville politics, Mr. Reynolds brought his nephew, William T. “Bill” Morris into the family business in 1925. Bill Morris (grandfather of Gus Morris, Jr.) took over the business from his uncle Gus following his retirement in 1934. 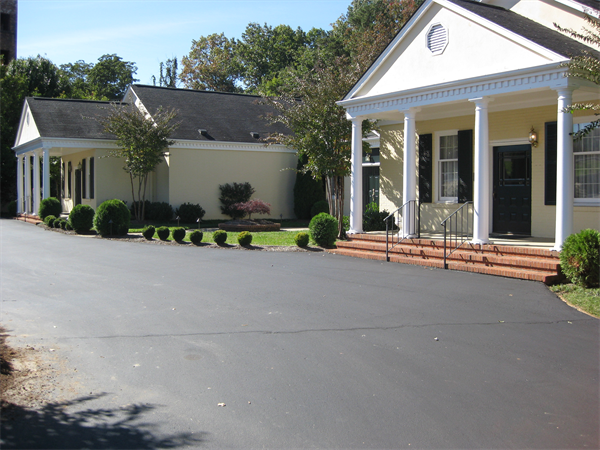 During his time in the leadership of Morris Funeral Home, Bill moved the business location to the 100 block of Merrimon Avenue also changing the name to Morris Funeral Home. Gus Morris, Sr. joined his father in the family business in 1962 and following the death of his father in 1971, became the third generation of the Morris family to own and operate the funeral home. During Gus Sr.'s time managing Morris Funeral Home, he relocated the business to 304 Merrimon Avenue by building a new funeral home in 1966. 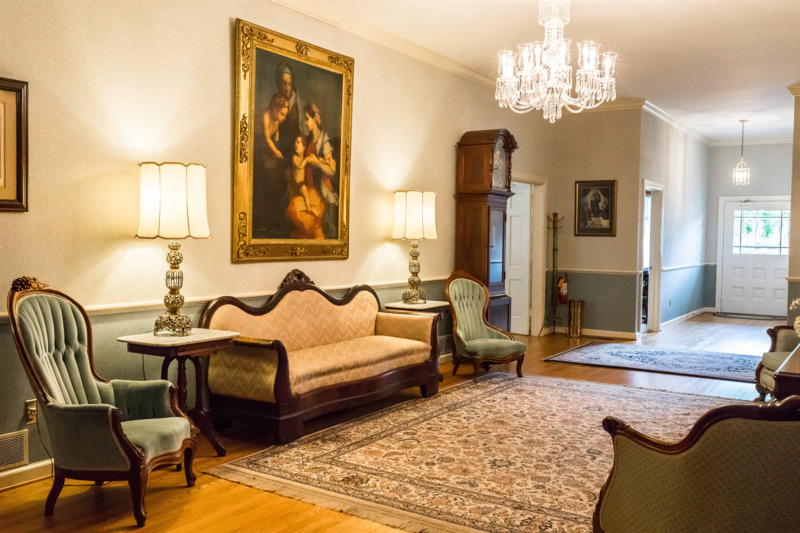 This new location included a chapel and large reception rooms filled with beautiful antiques and paintings which had been passed down from previous generations. 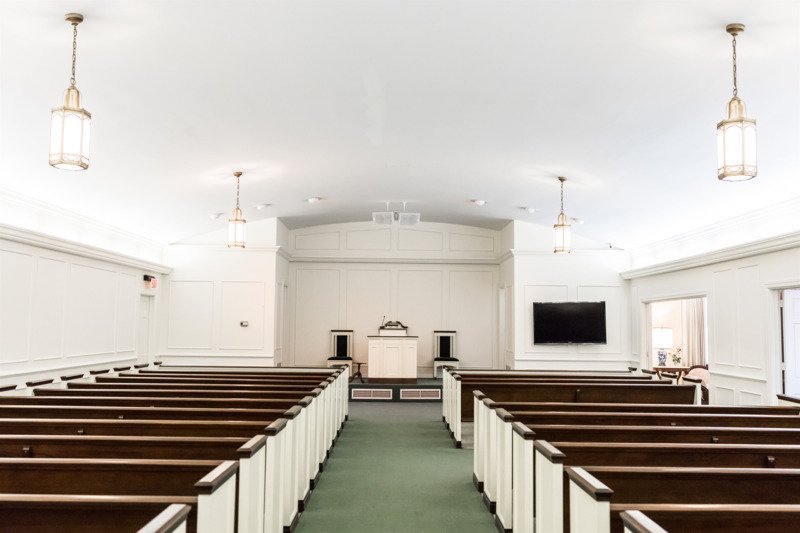 Always looking to enhance the services offered to families served by Morris Funeral Home, Gus Sr. oversaw the installation of a crematory in 1982 making this another first for Buncombe County. Gus Morris, Jr. joined the funeral home family business in 1985 and worked alongside his father until Gus Sr.’s retirement in 1990. Gus, Jr. continues the family business today, with the same business principles and values of those before him. Recently, his son Seth Morris joined the staff making him the fifth generation of Morris Funeral Home. We are proud that in 2019, the Morris family will celebrate 100 years of service to the families of Western North Carolina. Founded in 1919, Morris Funeral Home and Cremation Service has been serving families in the Asheville/Buncombe County area longer than any other funeral home. Family owned and operated for close to 100 years, Morris Funeral Home is under the direction of the fourth generation of Morris family members. Our establishment is operated by a staff of highly trained, local personnel, people who make their homes in Asheville, people who are interested in this community because they live here, just as do those they serve. This special interest is reflected in the friendly, courteous attention at Morris Funeral Home, a personal interest in the welfare of neighbors and fellow citizens. Because we at Morris Funeral Home have never been content with just "ordinary" funeral service, we have established a reputation highly regarded in Asheville - a reputation for thoughtful, dignified service under all circumstances. At Morris Funeral Home we serve just as we would like to be served. As a full-service company, we handle all the related details of planning ceremonies. From our facility, we can assist you in selecting cemetery property, making arrangements for burial outside the area, purchasing flowers and purchasing monuments for the cemetery. We offer the greatest number of choices in our region. Our charges are clearly itemized and presented before you make any decisions. Of course, our fees usually change annually, so feel free to call for current prices. A native and lifelong resident of Asheville, Gus, Sr. retired in 1990 from day to day funeral home management operations. He was a graduate of UNC Chapel Hill wth a BS in Business Administration, he is a veteran of the US Marine Corp. and has been a licensed funeral director since 1962. He was formerly active in various civic organizations. He and his wife, Mary reside in Asheville. In addition to his son, Gus, Jr. he has a daughter, Lisa, four grandchildren and a great-grandson. Gus joined the family business in 1985 and has been a licensed funeral director for more than 30 years. He became the fourth generation at the helm of Morris Funeral Home following his father’s retirement in 1990. A native of Asheville, he graduated from Asheville High School in 1978 and was a psychology major at UNC-Asheville. He is a member of First Presbyterian Church, Asheville and active in many clubs and organizations. Gus enjoys many outdoor activities including spending time on the water, off road motorcycling and camping off the grid. He and his wife, Vicki have a special affinity for out west and spend as much time as they can in Utah, Arizona and Colorado. He is the proud father of two sons, Seth and Aaron. Seth is the fifth generation to work in the family business. Aaron was in the United States Air Force and passed away in 2012 at the young age of 25. Gus and Vicki adore time with their grandson, Abram and reside here in Asheville with their two dogs, Hercules and Pink. Steven comes from Western Pennsylvania. He graduated with honors from Indiana University of Pennsylvania with a B. S. degree in Communications Media. After several years of working in radio in Charlotte, NC, Steven returned to Pennsylvania to pursue a new career in the funeral industry. He attended the Pittsburgh Institute of Mortuary Science and obtained his North Carolina licenses in both funeral directing and embalming at Morris Funeral Home. Making sure that families and their loved ones are cared for with the utmost respect and dignity is a responsibility that he takes very seriously. He enjoys outdoor activities and he has played guitar for over thirty years and performed throughout the southeast with a professional variety band. Steven is a Certified Crematory Operator with certification through the NFDA (National Funeral Directors Association). He also serves as the Secretary of the North Carolina Crematory Authority, a 7 member committee of the North Carolina Board of Funeral Service. Duane David Alexander began his career in 1993 after serving nine years in the United States Army. As a veteran of the Persian Gulf War, he knows of the importance of recognizing the people that serve our Country. He has joined the National Veterans History Archival Institute for the purpose of assisting veterans in recording their time in service, preserving their military record and officially placing it on file with the Library of Congress. As a licensed funeral director, Duane has been with Morris Funeral Home for over 20 years and manages the advance funeral planning services department. He has been a Rotarian since 1997 and has served at a club level as secretary, president; and at the district level, as assistant district governor. Duane is a member of the Benevolent and Protective Order of Elks, Lodge 1616, Hendersonville, NC. Duane has one son, Benjamin, who is an administrator for Buncombe County Schools. In his free time, Duane enjoys hiking and off road four wheel driving. Kevin came to the Morris Funeral Home family in December of 2013. Growing up in Candler he graduated from Enka High School before going on to pursue a career in funeral service. Kevin is a graduate of Gupton-Jones College of Funeral Service in Decatur, GA. He received his North Carolina funeral service license in August of 2010. He currently attends St. Barnabas Roman Catholic Church and is a member of the Knights of Columbus Council #8923. In his off time, he enjoys spending time with his friends and family. A native and lifelong resident of Hendersonville. Lisa joined the staff of Morris Funeral Home in 2006. She has been in funeral home administration for over twenty-five years. She has two sons, Michael and Cameron and four grandchildren, Bryson, Lawren, Natalie and Aaron. The member with the longest tenure of the Morris Funeral Home staff, Pat has been working with this family since 1968. As the caretaker of the precious antiques and furnishings at the facilities, she is responsible for keeping the building beautiful. Often, Pat will be found caring for the staff, making sure we have the TLC needed to continue to care for the families we serve. Pat was married to Gilbert Hall for over 45 years before his death in July of 2002. She and Gilbert raised five children and they have fourteen grandchildren and six great-grandchildren.